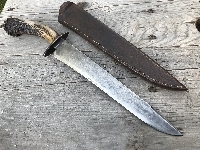 Here’s a recently finished hand forged striker by Brad. Based off an original design, it was forged from high carbon steel and heat treated to ensure a great spark. It measures 3 1/2″ long. This is a brand new bag just completed by Jerry Rice. Hand sewn and made from bark tanned deer hide, you can still see some small remanence of deer hair left on the hide. The bag offers many pleasing features such as a scalloped flap, scalloped pocket throat and a fringed accent around the bag. The adjustable strap is fit with an iron harness buckle and attached to the bag with forged iron rings. 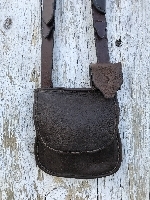 Measuring 9″ tall by 9″ wide this bag is the perfect size for hunting, shooting and trekking. 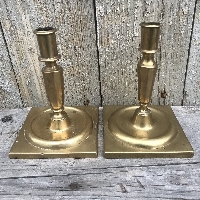 These are a similar, but non matching pair of 18th Century brass candlesticks. They feature early construction technology in a simple yet pleasing form. Both candlesticks show sign of wear and some minor repair, but overall remain in original condition. This is a very nicely built .45 caliber Reading Rifle, stocked in a piece of walnut and adorned with a tasteful amount of relief carving. 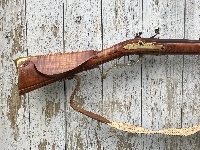 The rifle features a 38″ Getz barrel, Large Siler lock and brass mounts. 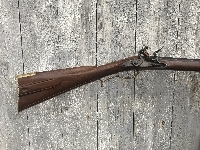 The condition of the rifle is superb, appearing to be in like new condition and well taken care of. The length of pull falls in at 13.5″ long, giving the rifle an overall length of 53″. Maker unknown. This is an entirely hand made 18th Century Turn Screw. It has been crafted from original wrought iron and heat treated using traditional 18th Century technology. It measures 2 3/4″ long. 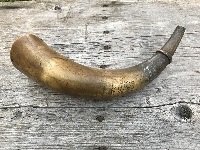 This is an original, 18th Century brass snuff box that has been paired with a hand made weeping heart flint striker made by Shane. 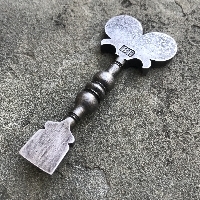 Inspired by original works of the period, the weeping heart striker is made from high carbon steel and lightly adorned with an engraved border. 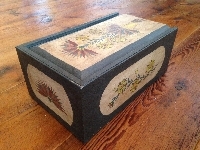 The box is in extremely nice condition and exhibits quality construction techniques throughout. The dimensions of the box are 2 7/8″ long by 2 1/ 8″ wide by 1″ thick. 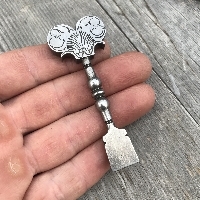 This decorative flint striker, engraved in a bilaterally symmetrical design of the Baroque style, was hand crafted by Shane using original, 18th Century Wrought Iron. The engraved decoration was free hand drawn and chased with hammer and chisel, and the background then lightly stippled for contrast. 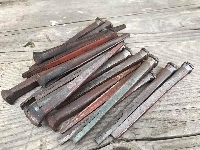 The heat treating on the iron was done using all traditional 18th Century techniques to ensure a proper level of carbon in the iron. The striker has been paired with a beautifully made brain tan and quillwork pouch made by Bill Wright. This knife and sheath combo was made by Rich and Jeanne McDonald. The blade measures 9 1/4″ long and the overall length of the knife is 14″ long. 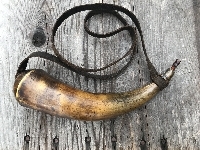 It features an iron guard, iron pommel cap, antler handle and a handsomely decorated sheath.